At This Tribe, one of the areas we have been examining closely it the role of reviews. Following some initial discussions at the Ecommerce Expo last week and further online research since then, This Tribe is trialling Trustpilot as a way to gather reviews in a 3rd party environment where readers can be confident that what they read is not under the control of the site being reviewed. Our view is that this independence is a key part of the credibility of the reviews, and it's interesting to note that Google is paying more attention to the review sites as you can see under "4. Reviews and lots of them". Rob, one of the This Tribe team, set about examining some of the many review sites on the market and selected Trustpilot largely on the basis of its simplicity. Seller rating extensions make it easier for potential customers to identify highly-rated merchants when they're searching on Google by attaching the reviews to the merchant's Google Product Search and AdWords ads. These star ratings allow people to find merchants that are highly recommended by online shoppers like them. To be eligible the merchant needs to have 4 or more stars and have at least 30 reviews in total. 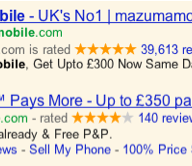 Once the merchant has achieved this, it still might take up to 4 weeks in order for Google to index the results. Are you more tempted to use a service or buy a product if you can see independent reviews? I've just put the phone down after a conversation in which my request to talk to past customers was declined. Although the service on offer sounded great, the fact that the provider didn't feel able to put me in touch with any of their former clients drained my faith in them and their offering. I won't be becoming a client.